A day before Chester’s 4th birthday, I baked a dog cake (safe for human consumption as well) for him and it turned out pretty hideous looking. 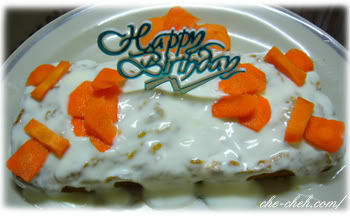 The cake main flavours are peanut butter, honey and grated carrots with plain yogurt frosting and sliced carrots as decoration. I know. I’ve never seen any cakes like this before. But for a dog, he’ll ‘sapu’ anything. Right Chester? If I give him the whole cake, he’ll literally swallow it. I tasted the cake a little and aiyoooooo I nearly cannot down it. he didn’t invite his friends from the neighborhood kah? My hooman says that I’m a picky eater. So, not everything I will sapu one. That’s remind me of updating my fantasy premier league squad. Snoopygirl, hi Snoopy…actually it had just passed. Wah you sure are picky. 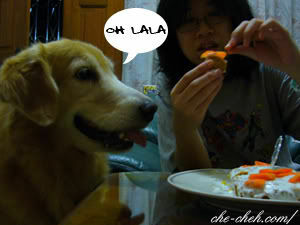 Wah .. doggie also got cake ..
Every time I hop to here, it will remind me of that, haha! 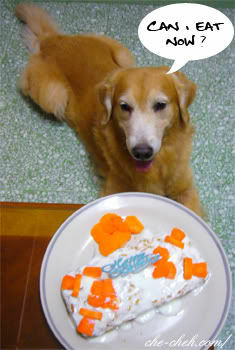 Dawn, :silly: you should see him swallow the sliced cake. Wonder how his stomach can digest properly. Hcfoo, oh yes I’m thinking about that idea.